As the summer days continue to warm up, it gets harder and harder to figure out what to wear to work. When you wake up, you can’t imagine putting on layers to look professional at the office. New York City women, I feel your pain. We have window units and I can’t blow dry my hair and have the air running at the same time. After blow drying my hair for 20 minutes, the last thing I want to do is put on a skirt and a blouse. An easy way to make the hot and humid weather bearable is to wear a non-fitted dress and carry along a blazer (similar to here and here). 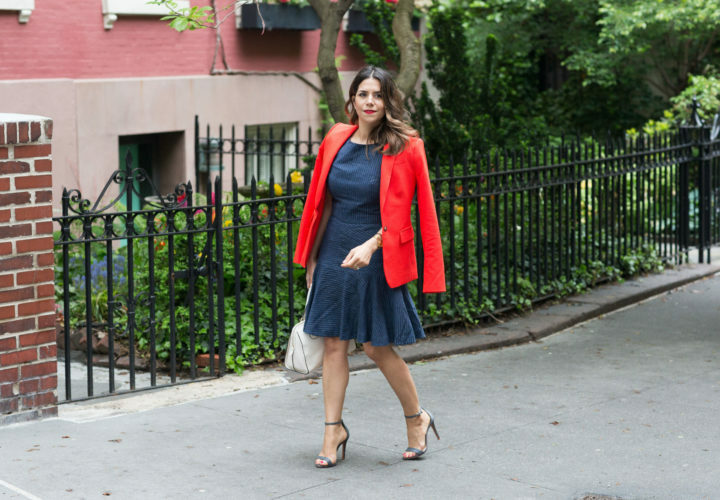 If your office is like most, you’ll be freezing by mid-afternoon and ready to throw on a blazer. The dress I’m wearing is from Ann Taylor and has a slit in the back and front. Most of the time, I wouldn’t pick this type of dress for work, but the slit is not revealing when I walk. You need to be aware of the front slit when you sit down, but it’s rare that we’re sitting down in the wide open. Most of the time we’re sitting behind a desk or table. Since the dress is longer, I got the dress in petite small. When I tried on the petite xsmall, it was tight around my armholes. Everything at Ann Taylor is currently 50% off, check out all my picks here! 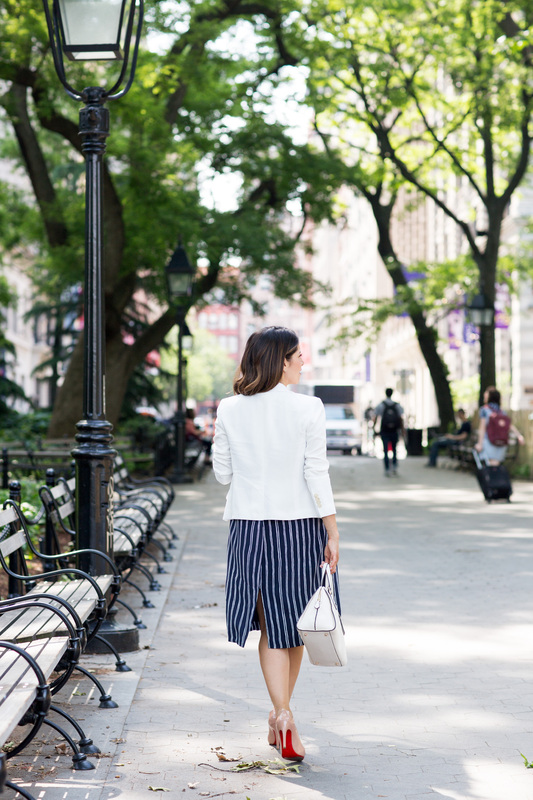 Love the vertical stripes – such a fun twist on the classic!